Doing a Google Internet search for ‘Alfred Hitchcock’ yields a mind-boggling 1,970,000 matches, and, although not quite as numerous, the amount of books dedicated to Britain’s most famous director is equally off-putting for any would-be fan. The difficulty is finding something new- a novel attitude, study or approach, towards what is otherwise in danger of becoming dramatically over-farmed cinematic pasture land. It is this premise that Marc Raymond Strauss’ book takes, in that it focuses exclusively on the ten silent films made by ‘Hitch’ between 1925 and 1929 and seeks to identify the embryonic precursors of the career that was to follow these ten titles. This commendable starting position is supplemented by a very clear chronological structure and discussion of casting as well as technical issues (like the differing running times of various releases). It is here though that the problems begin, for the book is only a mere 215 pages including both a bibliography and an index. Given that the author discusses nine films (he devotes a page to the sadly missing The Mountain Eagle), it doesn’t allow for a hugely detailed analysis, especially of such archetypal Hitchcockian works as The Lodger and Blackmail. Therefore, the mention of such aspects as the running times becomes slightly unsatisfactory as it holds up the more pressing matter of identifying stylistic and thematic continuities in what are, after all, critically neglected films. Once the analysis starts there are some useful points to be made, but clouded by an unnecessary (in my view) over-use of abbreviations. These prove a trifle distracting, as we get ‘Hitchcock now cuts to an ECU of Crewe’s face, angled somewhat SR just like Tracy’s face had looked earlier’ before ‘quick cut back to the same ECU of Crewe’s face, saying via title “I’ve got it”, as he flings her clothes OSL’. (p.206). The effect of such writing is to cause mental agility when sometimes what is desired is a measured illumination of a sequence one has always interpreted in a certain way- that some critical analytical light is thrown on it. There is an abbreviations list, but needing to constantly refer to it (for the letters do not stop at shot/space types but extend to authors and even film review books!) is akin to being on a train that stops at every small station en route to your destination- what starts off as a novelty soon becomes a real nuisance. The other main problem, and one that would not be solved by the ‘find and replace’ computer command, is that of the contrast in tone. On the one hand, Alfred Hitchcock’s Silent Films takes on the mantle of an academic analysis. On the other are certain jarring comments and references, for example Strauss observing that ‘the lodger and Daisy go out on a date together, Mom freaking out’ (p.39) and later referring to the director as ‘Alfie’ (p.203). It seems that the book does not know exactly how to pitch its worthy subject-matter, and the whole exercise is less successful as a result. In his Preface, Strauss states that his book will appeal to expert and novice alike- ‘both ends of the Hitchcock continuum should find many morsels of interest to nibble on here’ (p.1). Perhaps this is the problem- what ought to be a satisfying finger-buffet becomes instead some mixed hors d’oeuvres. Yes, there are some tasty snacks to be had, but there is also the possibility of momentary indigestion. 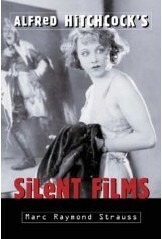 'Alfred Hitchcock's Silent Films' is published by McFarland & Company.